22" x 23" x 18.5"
This elegant Art Deco Shoppe was started in 2005 in a Bluette Meloney class at Shellie's Miniature Mania in San Carlos, CA. Suze finally finished it in early 2007. The gorgeous interior has FAUX BOIS walls, with a burlwood effect. The exterior walls around the entrance and back counter are marbleized. The sides of the building are painted to resemble block stones. The floor panel on the entrance way was painted by hand (all the dots). It took one year to find all the furnishings for this store. 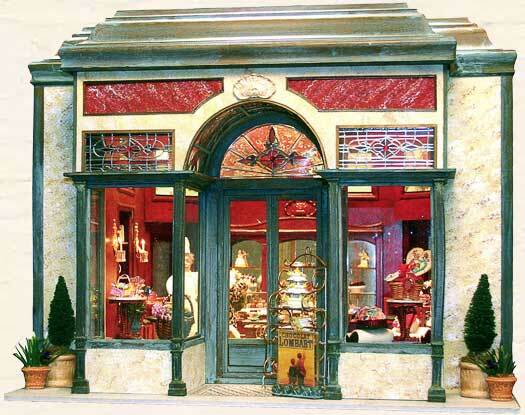 Notice the Pierrot Gourmand candy holder, stained glass windows and the chocolate paintings. The paintings were commissioned to Paul Tyree-Francis.